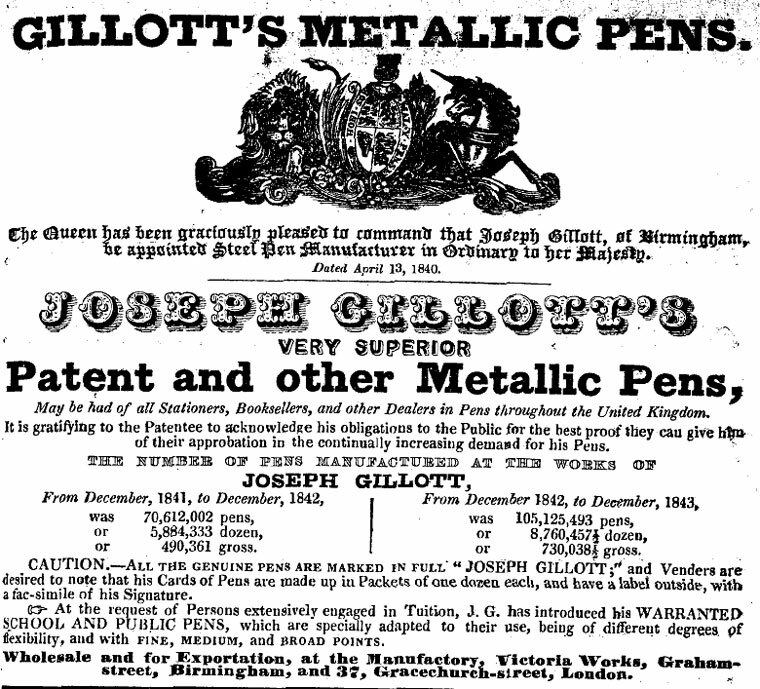 1799 Joseph Gillott was born in Sheffield. 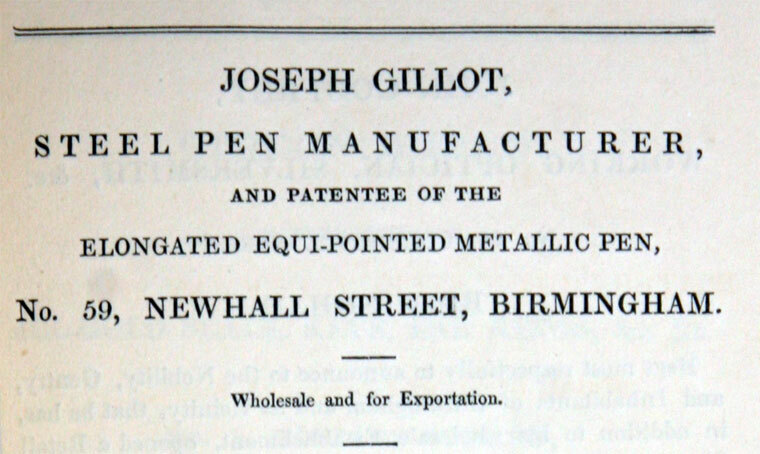 1822 He moved to Birmingham. 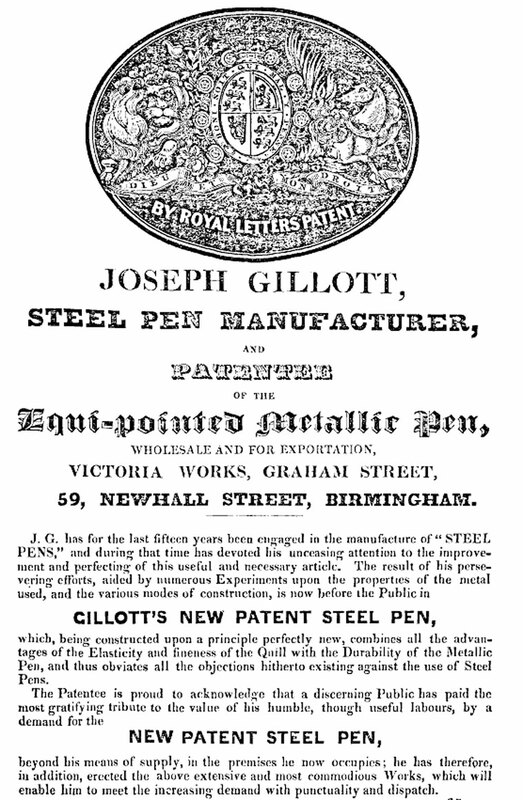 The skills he had learned as a cutler stood him in good stead for Birmingham's small-metalware trades. 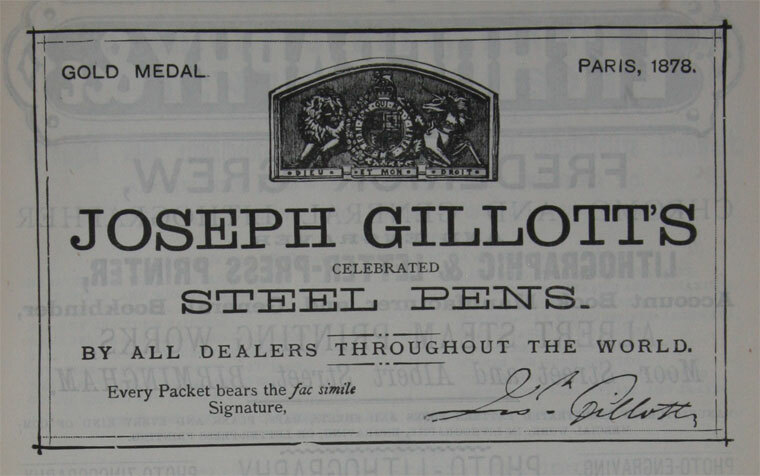 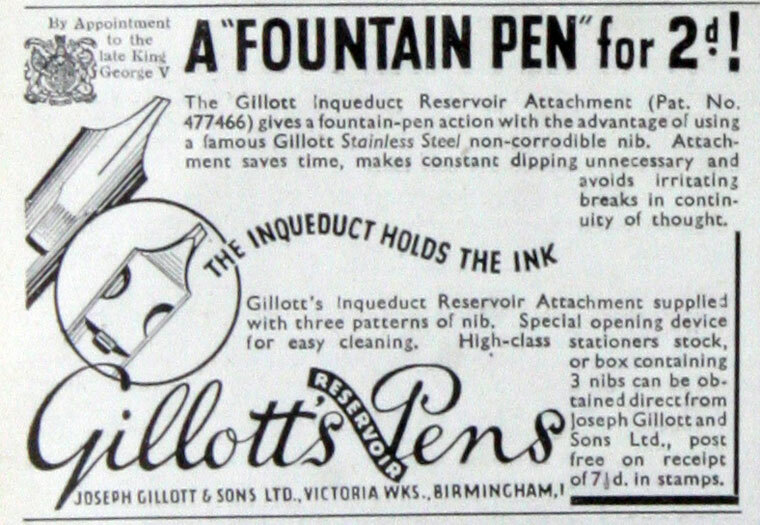 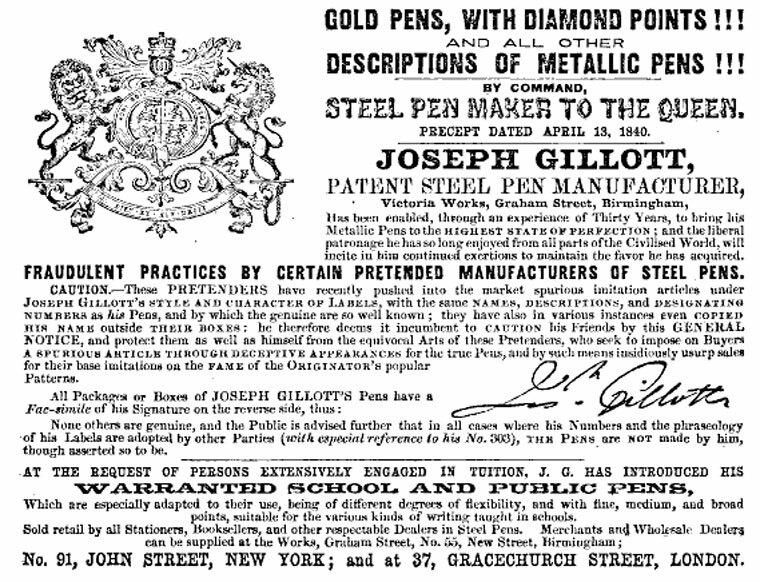 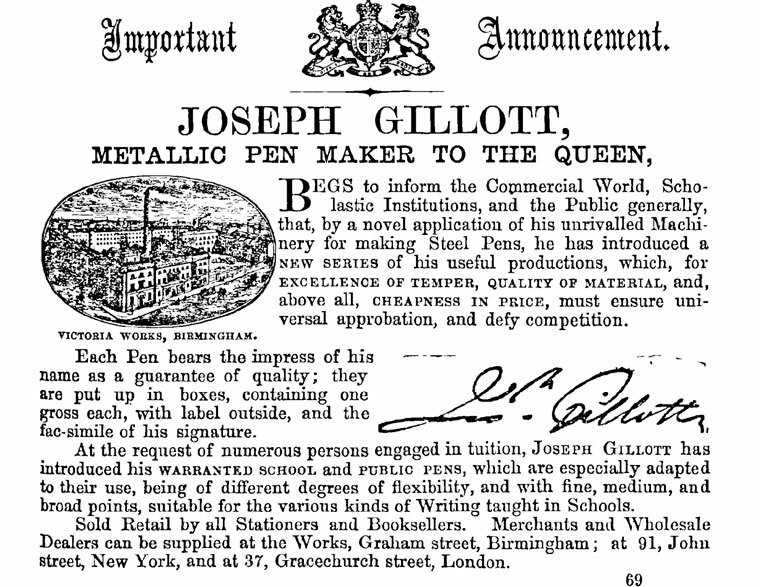 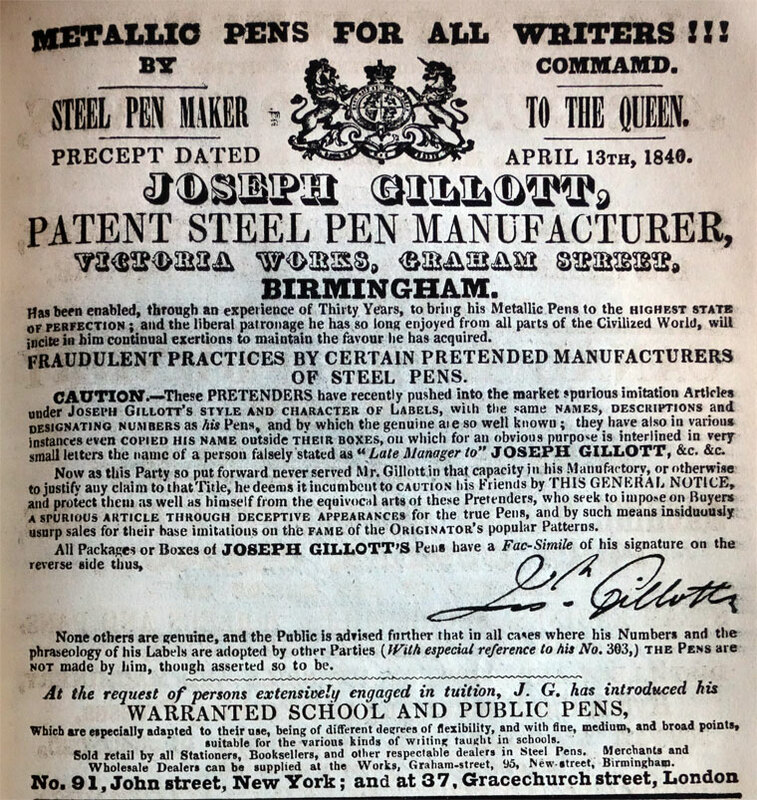 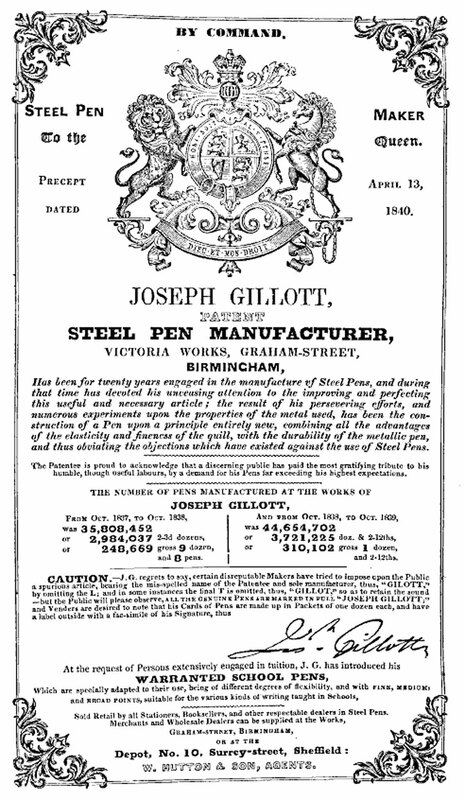 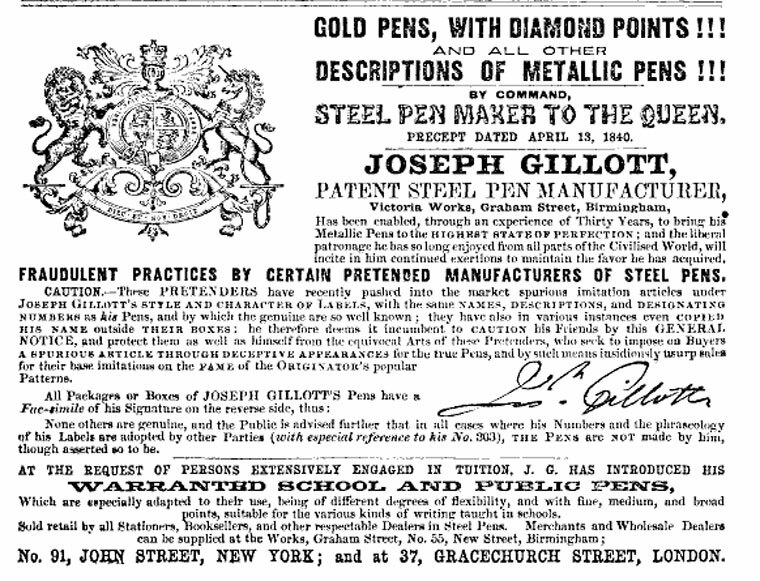 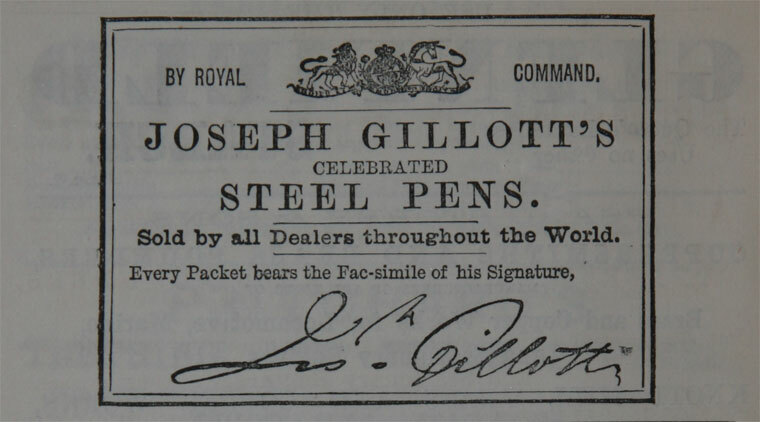 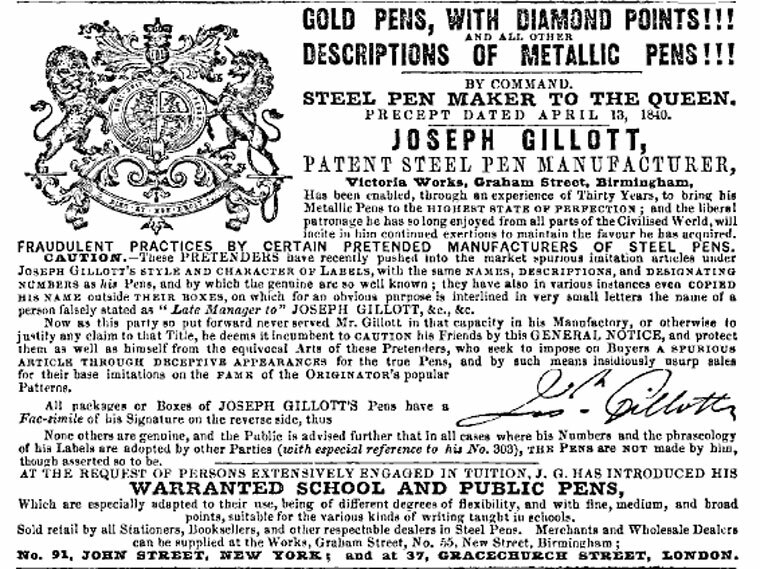 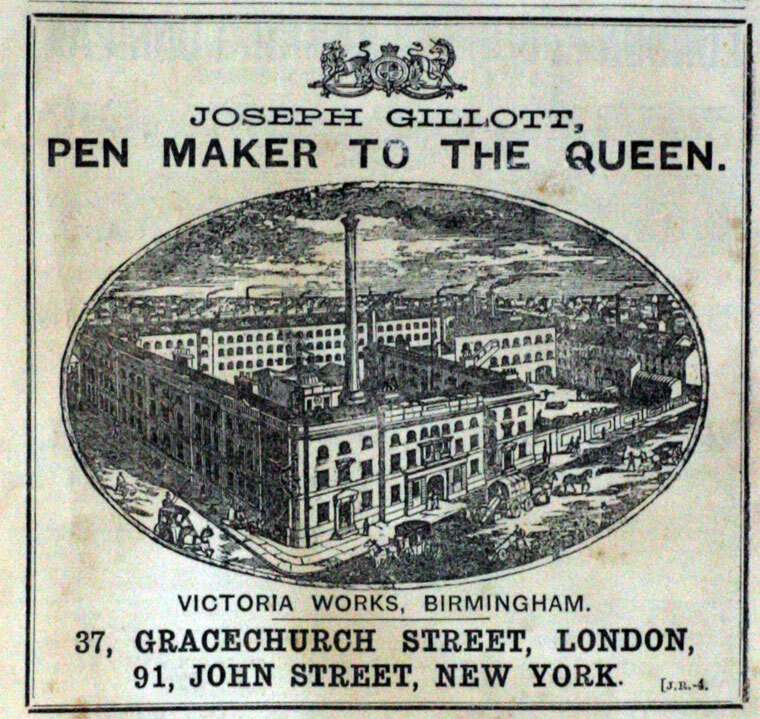 1823 Joseph Gillott was making steel pens when he married Maria Mitchell, the sister of John and William Mitchell who were already manufacturing steel pens, and was drawn into the trade. 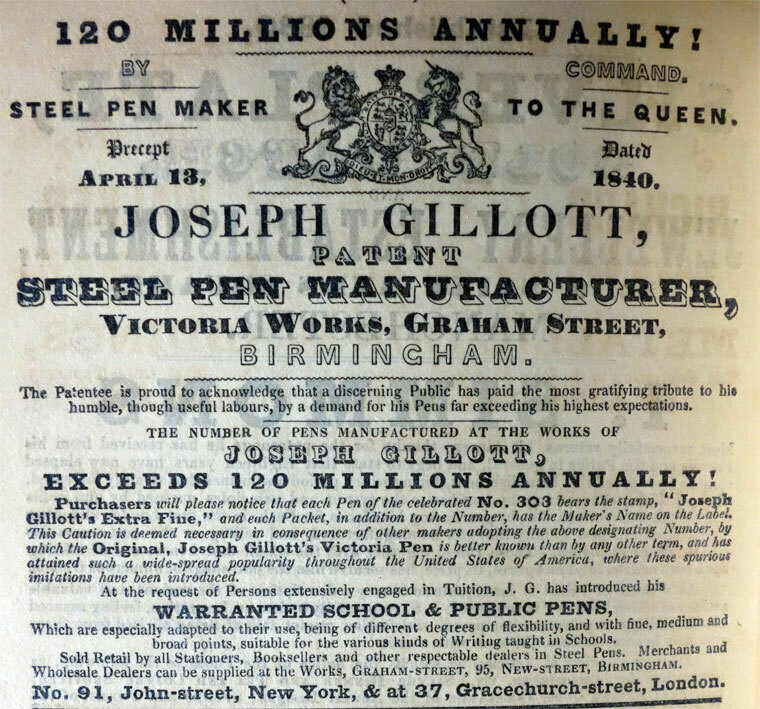 c.1827 He began to experiment making pens in Bread Street and set up business there. 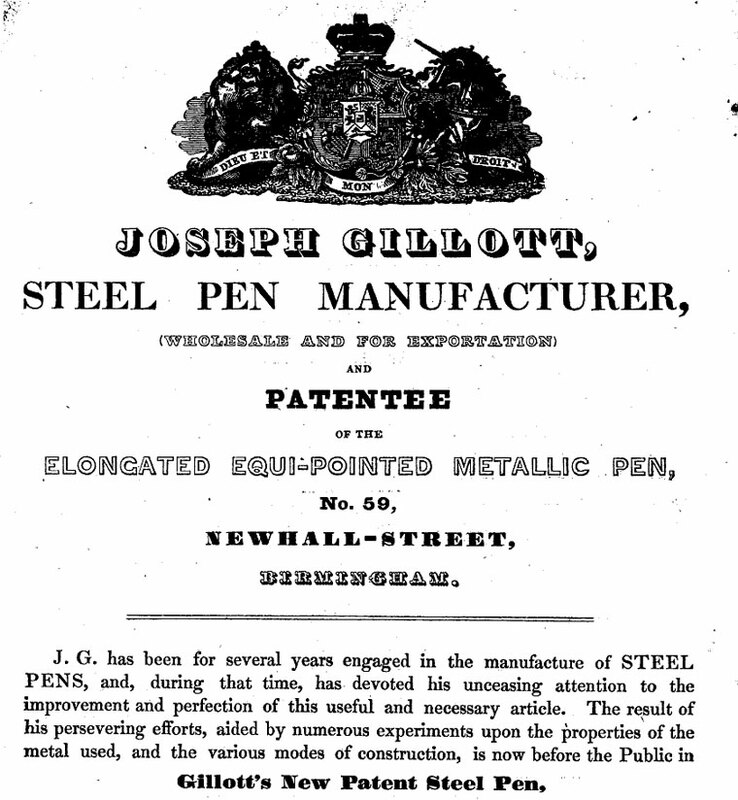 Later he moved to Church Street and then on to Newhall Street. 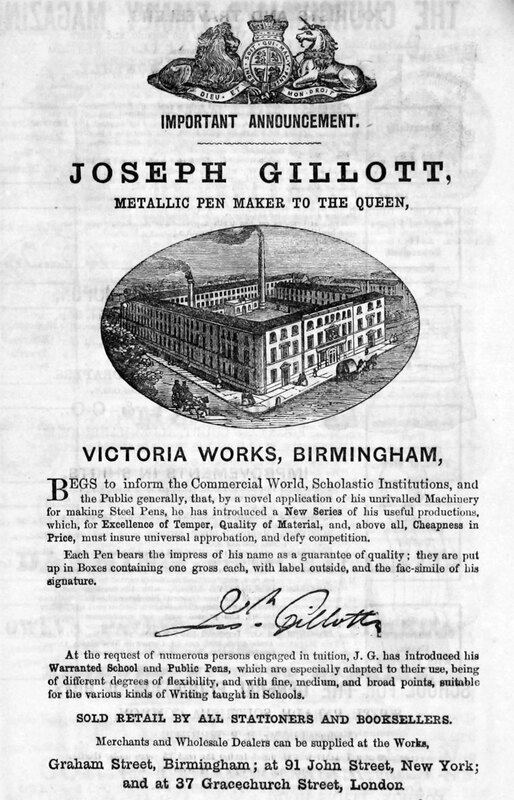 1849 Advert shown on this page. 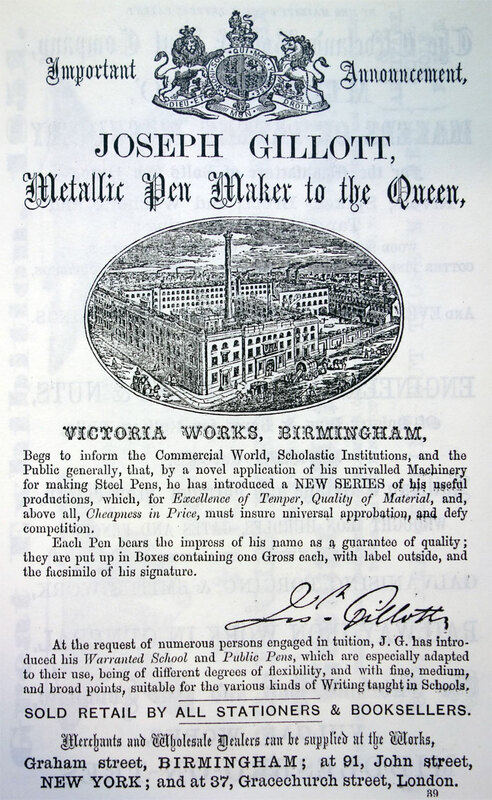 1853 He moved to Graham Street, where he developed the Victoria Works, one of the largest factories in Birmingham. 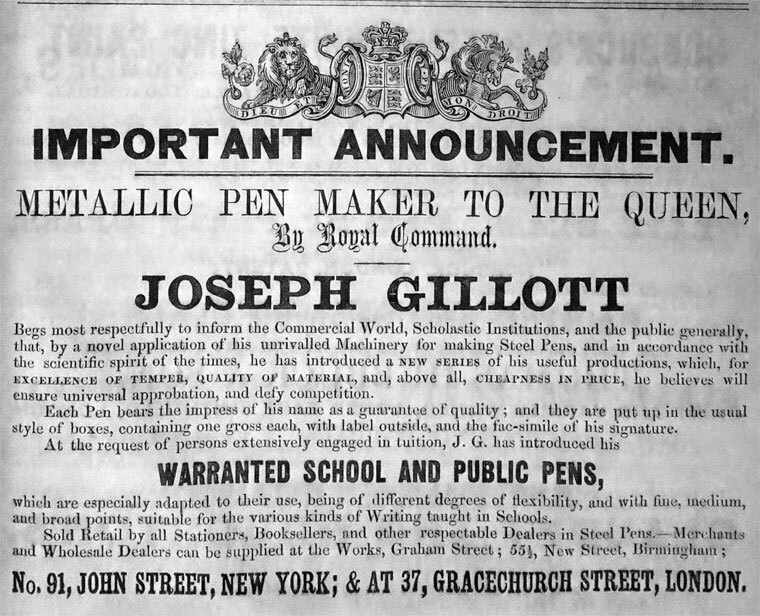 1872 Joseph Gillott, the founder, died. 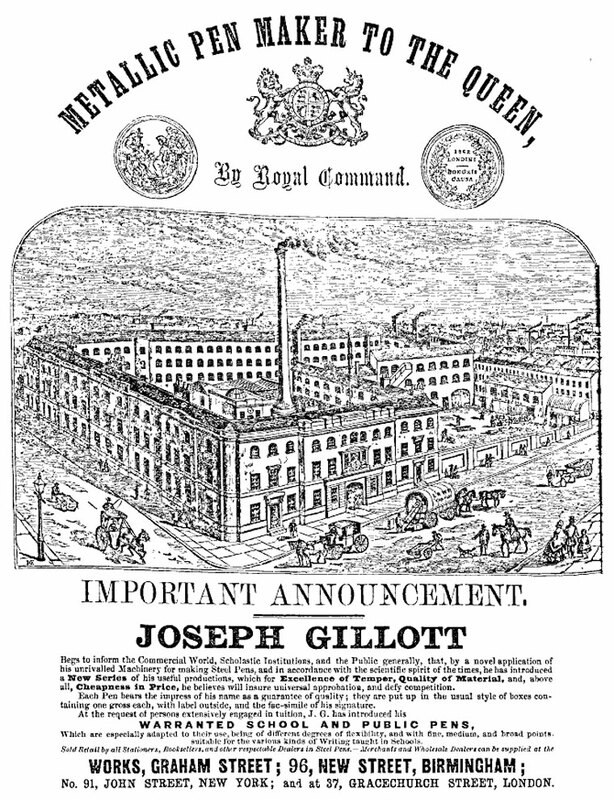 By 1881 the company had offices in London and New York. 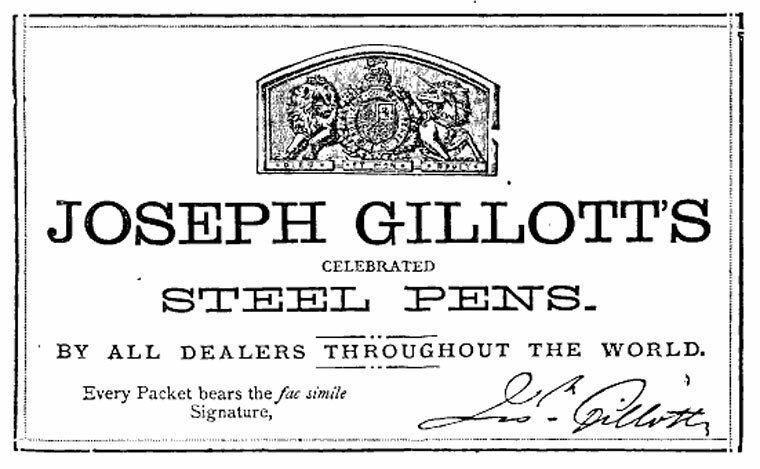 1903 Joseph's son, also Joseph, who had inherited the company, died in 1903. 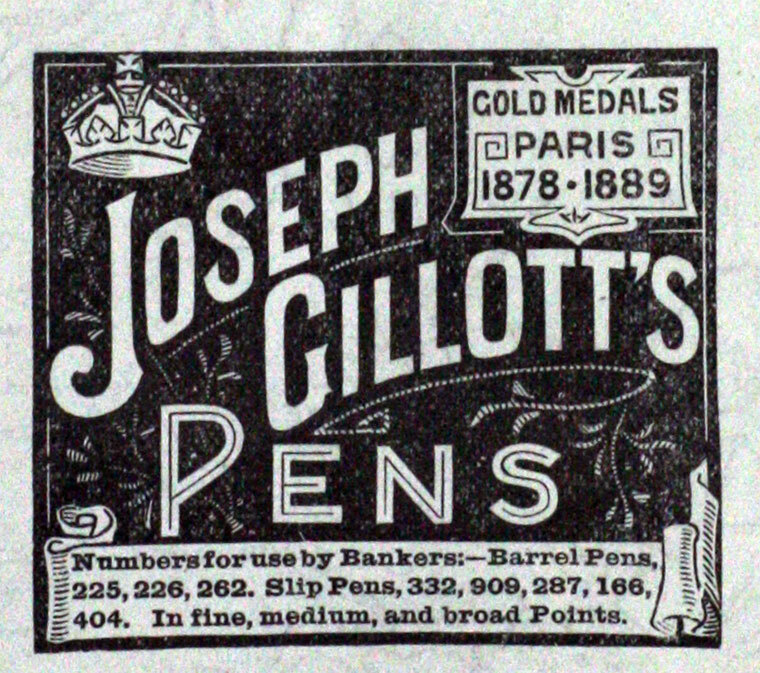 1907 The founder's grandson, Joseph Henry Gillott, died a millionaire. 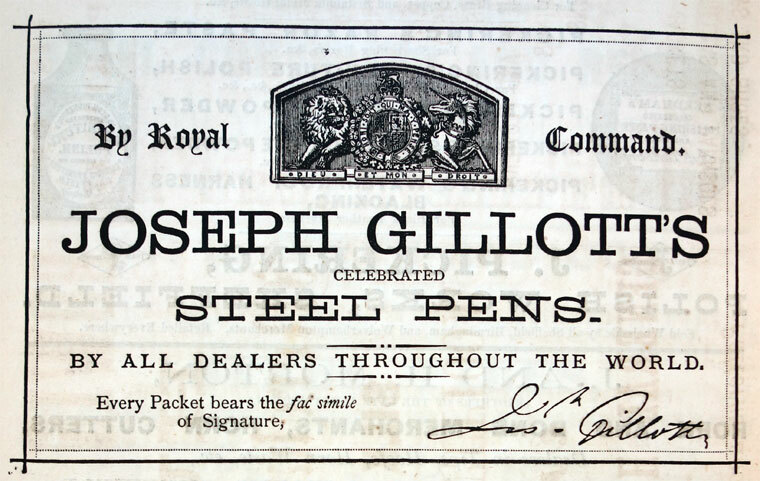 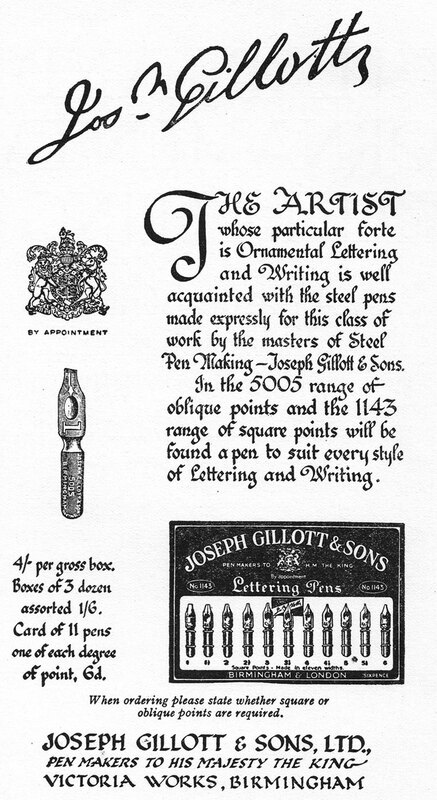 1926 Joseph Gillott and Sons became a limited company. 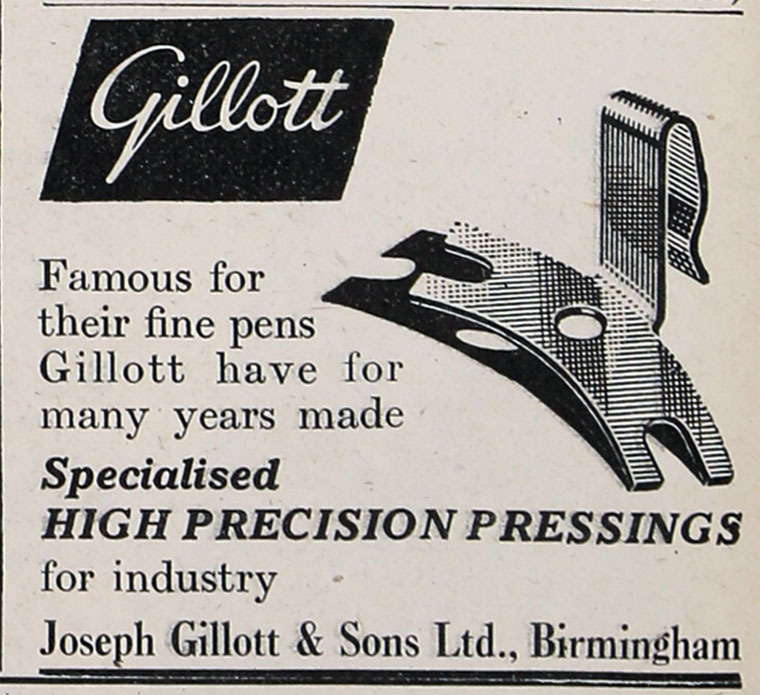 1930s Bernard Gillott was head of the company. 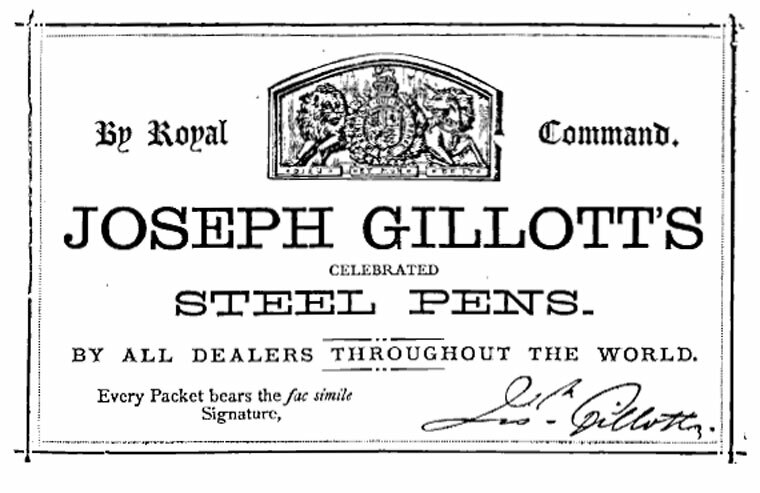 After World War II Nicholas Gillott took over. 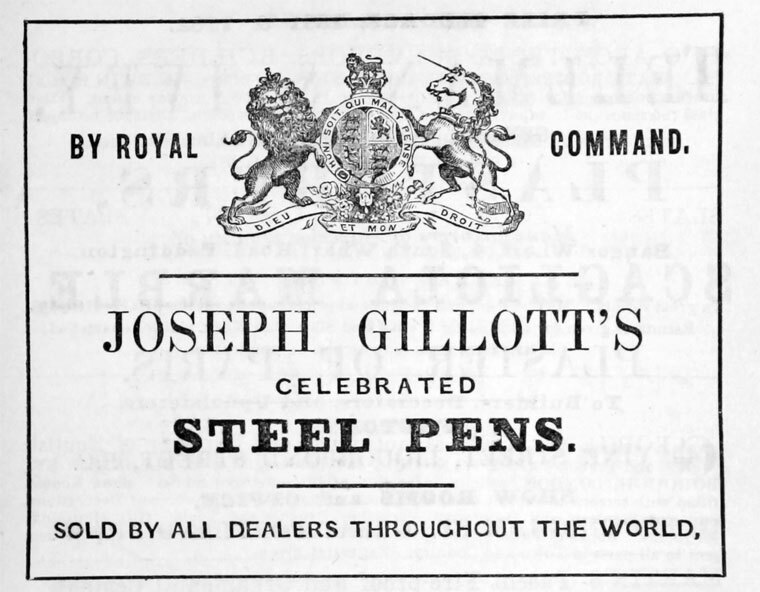 1954 The company became part of Alexander (Silverthrone). 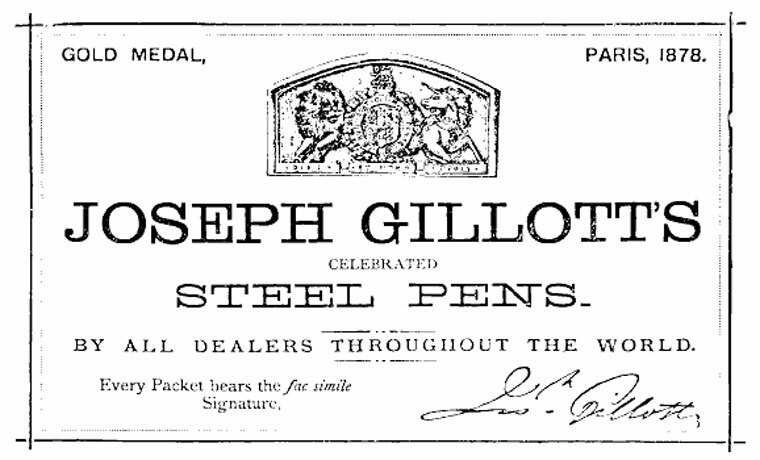 1969 Acquired by British Pens. 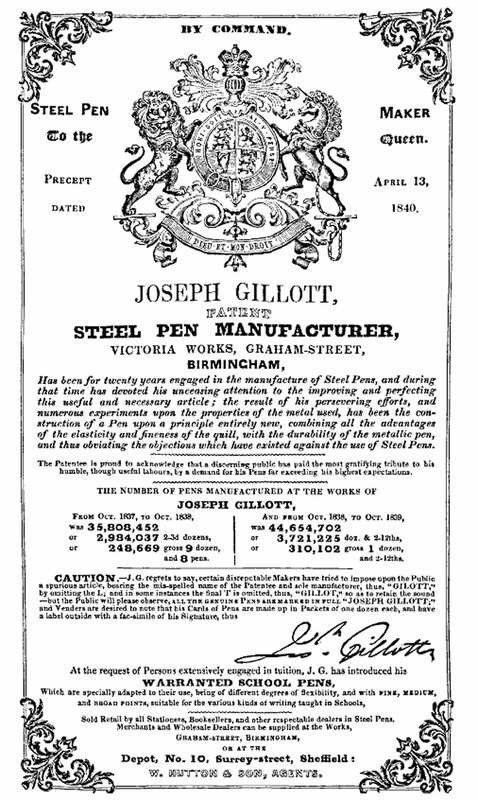 This page was last edited on 22 December 2016, at 14:26.